All of us have been consumed in a moment of fear. For various reasons, and during different seasons of our lives. As children, so many things can bring it on. The dark. Losing our parent in the grocery store or in a crowd at a parade. Losing your favorite Stuffie or an odd food that you have to eat to get dessert. As adolescence, it’s over an impending test or asking a girl (or boy) to a dance. Maybe it’s a first day of school or riding the bus to school. Fitting in with the “in crowd”. The school talent show. Not being chosen for the softball team. And then there is college — the first night in the dorms. Remembering to take good notes in lecture. Getting a job and balancing both work and school. Deciding what to major in. How to go to sleep at 2 am after studying all day and not accidentally sleeping through your alarm for the 8 am class with the test. Not tripping on the graduation stage as they call your name. Suddenly, we are all grown up and now we have a house to manage. A mortgage. Credit card bills. A partner relationship to manage, possibly children. A job and a boss; whose personality and whims are responsible for helping you to pay for all of the above. In life — FEAR NEVER DISAPPEARS. It simply changes faces over the course of one’s life and the constant question is: How will you manage me today? 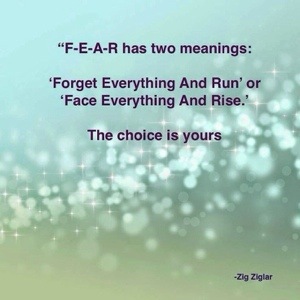 I love the above quote because I think that it embodies the two reactions I’ve had to fear over my life. As a young person, I certainly ran. Fear was a constant companion that tinged everything and I mean EVERYTHING that I did, thought of doing, or –somehow — never got around to doing. It was the small voice that offered the worst outcomes of the what if situations. If I have learned anything over my 39 years, it’s that energy is finite. In that truth, it means that there are wiser ways to use it than others. And in a moment of fear you must quiet your mind and choose how to allot the molecule knowing it will never come back. Now don’t get me wrong, I am still often a victim of my own fear cage. It’s invisible and wide and often the consumer of a large batch of my imagination, but I like to think it rears its head less often than it used to. In moments of panic I try to stop my monkey mind and ask myself, “What is it that is causing this panic?” “What is the worst case scenario?” “If that worst case scenario hits, what can I do to help myself?” Pushing my mind to a LOGICAL walk through helps me to come off of planet HOLY S%#^ and returns me to Earth. I encourage you to try it and see how you too can rise and prosper in a time of panic rather than being consumed by the fear that most certainly will keep you the most uncomfortable type of company. You don’t have to have it all figured out, just have the bravery to sit with the feelings, let them wash over you and then away from you.